With Thanksgiving approaching, it’s time to get creative for your holiday table. This DIY Baked Cornucopia Centerpiece is a different take on the traditional cornucopia that is so often seen this time of the year. There are many Greek or Roman Mythological origins for the cornucopia, often associated with the harvest, prosperity, or spiritual abundance. In modern times, the cornucopia is typically a long, hollow, horn-shaped wicker basket which is filled with various kinds of festive fruit and vegetables. In North America, the cornucopia has come to be associated with Thanksgiving and the harvest. For something different this year, bake your own cornucopia centerpiece instead of creating one from fabric, or using the traditional basket. 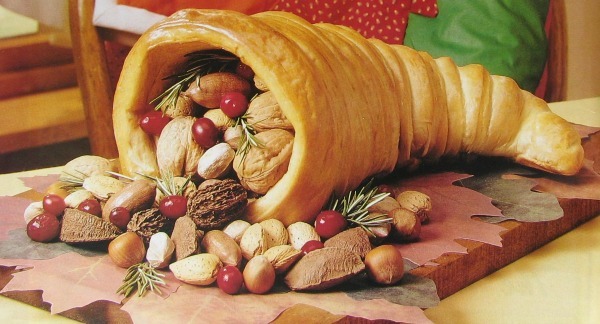 The cornucopia is made from frozen bread dough and then baked. Fill it with nuts, like the one shown here, or even some faux gourds so often seen around Thanksgiving. 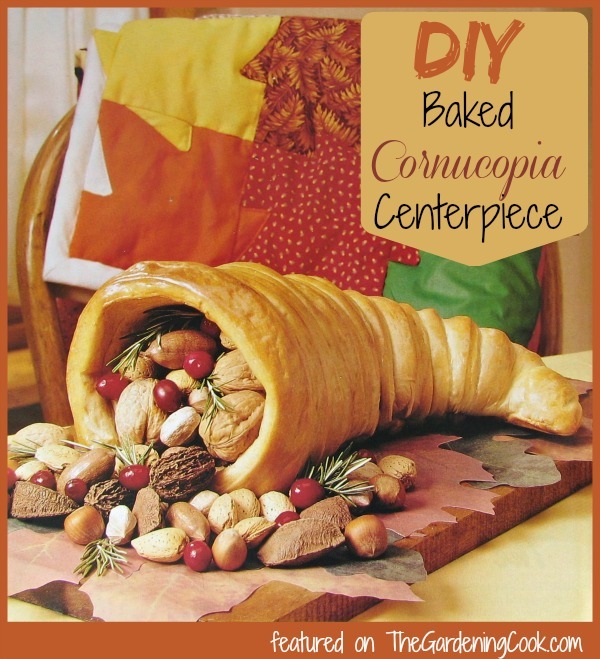 Make your Own Baked Cornucopia Centerpiece for Thanksgiving! To make the form, roll the disposable pizza pan into a cone shape with an opening about 5 inches wide. Curve the pointed end around to one side to create the cornucopia shape. Spray the form and the baking sheet with non stick cooking spray. Place the completed form on the cooking sheet. Roll out the bread dough into a rectangle that measures 15 x 9 inches and is about 1/4 inch thick. Cut the rectangle into15 x 1 1/2 inch strips. Starting at the curved, pointed end, wrap one strip around the form, overlapping the strips by about 1/2″ as you wrap the cornucopia. Pinch the ends together to seal. Cover with a tea towel and let it rest for about 15 minutes. Meanwhile, beat the water and egg and brush over the cornucopia. Bake at 350º for 20 minutes. Cover the cornucopia with aluminum foil and continue baking for 20 more minutes or until the bread sounds hollow when you tap it. Cool 10 minutes on a wire rack. Carefully remove the horn. Cool completely. The DIY cornucopia centerpiece can be made up to five days ahead of time. Store at room temperature, covered lightly with a tea towel. This idea and photo have been shared from an old issue of Crafting Traditions Magazine, no longer in print. Originator of the idea is Jacquelyn Dickey from Missouri.